The duo once again impressed as the Lopns signed off in a miserable campaign with another lukewarm performance. 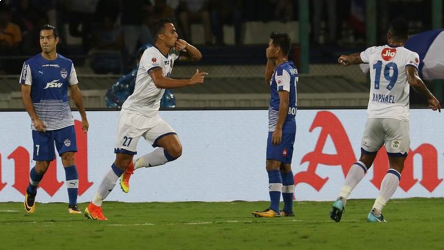 Delhi Dynamos FC played out a 2-2 draw against FC Pune City in their last Hero Indian Super League clash of the season at the Jawaharlal Nehru Stadium, Delhi, on Friday. 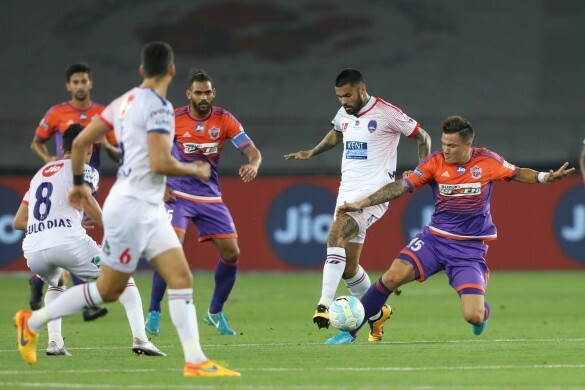 Even though the game meant little for FC Pune City, who had already qualified for the playoffs, both sides put on a display of some scintillating attacking football. The visitors had to come from behind twice in the game to take away a well-deserved point. In-form Kalu Uche scored twice for Delhi in the first half, while both goals for Pune came from Emiliano Alfaro, once in each session. Arnab played quite well, despite conceding two goals. His saves at regular intervals kept the Delhi outfit in the game. the keeper was rock-solid saving the only two shots (apart from the two goals) he faced on target and completing every pass and catch to help the team. 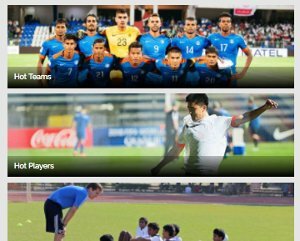 The former Minerva Punjab player had a rather challenging game up against Sahil Panwar and Issac Vanmalsawma. He caused the first goal for the opposition team by his foul on Marko Stankovic. Chipping in for Pritam Kotal, he kept running up and down the right flank with great precision but was sometimes left vulnerable by a lack of confidence. He did make an attempt on goal that hit the post. He denied a goal to Pune after everybody, even Das Sharma failed to keep the ball from the players in orange. While the 20-year-old defender is turning into an anchor for the future of this team, his immaturity on the field cost the Delhi team the chance to bid goodbye to this miserable season on a high as he gave away a penalty to Pune with his foul on Emiliano Alfaro. Just like Simranjeet on the other wing, Lugun suffered for a good amount of time against Ashique Kuruniyan and Baljit Sahni. Pairing up with Manuel Arana Rodriguez on the left, he maintained a decent link but was seen helpless on Pune's rare counters. He was substituted off at the 66th minute. After the previous game, everybody expected him to play a major role this time around and he did prove his mettle. He assisted the only open goal of the match and created three chances on the whole. Defensively he made three interceptions, a couple of clearances and a block to go with a tackle. 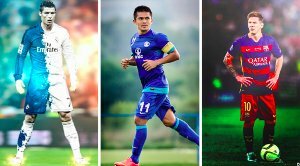 The highlights of his performance were the two shots on target and switching positions with Arana for better linkage that was easily visible on the field. Despite playing mostly on the wing, Chhangte has been tremendous in the centre, hitting the post once and winning the side the crucial penalty to take the lead in the 10th minute. Singh came on for Nandhakumar Sekar and only played for 11 minutes. He made seven passes with 87% accuracy. Kalu Uche was substituted by the Indian forward in the 51st minute, forming a solid partnership with Chhangte and from time-to-time with Arana. He had a passing accuracy of 89% and failed to leave a mark on the pitch. On a day when the entire team was not up to the mark, this young man had a not-so-bad day at all. He made only one bad clearance in the opening minutes of the game, but made some good interventions later on to make up for his mistakes. He could not have done much about the penalty though, but a series of magnificent reflex saves to deny Delhi on many occasions proved coach Ranko Popovic's trust in him. Baljit only played in the first half and was pretty much seen to be struggling against the sheer competence of Manuel Arana. He committed a couple of fouls but his lack of dominating play made all the difference on his flank. The Goan player has been the star Indian performer for the Stallions this season so far, heading into the goal and defensively doing his duties as well as being being splendid in all aspects of his game. But in this match, he was outshone by Paulinho Diaz and Matias Mirabaje on several moments. So, that made Adil play totally in Pune’s defensive half and as a result, he was hardly seen in the attacking third doing what he does best. With Adil sitting deep in the defensive half, it looked as if Pune lacked the attacking intent and the midfield seemed lost. The Kerala youngster started the game with lack of coordination between him and Sahni. He fouled the #7 of Delhi to award them a penalty, which Uche converted with ease. But, as the first half progressed, so did his individual ability on the ball. Ashique started sprinting into the opposition box, started to show his skills and completed dribbles, tried to find spaces between the defenders and took more of a central role than that of a man on the wings. Isaac started the game by making Simranjeet's life difficult. He kept the Punjab player on his toes and with Adil in the defensive half not being able to make his runs due to his restricted role, Isaac’s favourite target man for a cross was missing. He tried to make some impact in the match but Nandhakumar covered for Simranjeet and only allowed Isaac to make two crosses. Sarthak came on for Sahil Panwar at the 73rd minute mark and could not do much to turn the tables in favour of his side. Jewel has a mixed campaign so far and this game was no exception. He was given a full second half in place for Sahni. He could not keep up with the pace of the Delhi attackers and was outpaced several times. He had an opportunity to impress his coach after his absence through injury in the last game, but he failed to deliver yet again.